Fill in the “Text to display” field to add the name of the hyperlink to be displayed in the cell. “Screen tip” lets you choose the text that is displayed when you move the mouse over the link. The “Default” option also shows the path to the target file, while the “Simple” option shows nothing. Note: “Text to display” cannot be used as a reference in a formula. Instead of text, you can also select a cell reference. But a cell reference will only be updated when you create or edit the hyperlink. If you want continuous updating, use the HYPERLINK() function with the Function Wizard. Named ranges can’t be used at all for these values, although you can use them with the HYPERLINK() function in the Function Wizard. In addition to the standard hyperlinks from worksheet cells, worksheets, files, websites, email addresses and so on, a second tab called “Transfer” is available. You can transfer cell contents to new cells with this tab: This hyperlink will copy the contents of the cells Sheet1!A1:A5 of the actual file to the cells Sheet5!G1:G12 of the file that is defined in the “Destination” tab. Before clicking OK, you have to confirm your transfer entries with the update button (note that these cell references will update each time you run the hyperlink). Note: if a spreadsheet cell contains a PALO.DATA formula, and a value is set in this cell via a hyperlink transfer, the formula will not be overwritten. Instead, the set value is sent to OLAP for writeback. If you select “_new” or “_blank”, then the tab “Destination Window” will be activated. There you can enter additional information on the destination window of the link, e.g. size and location of the window. 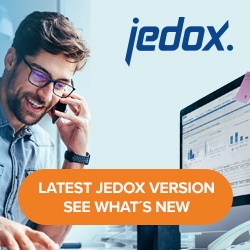 With the option #_blank you can determine which elements should be displayed in the browser window (note: Jedox Spreadsheets always have scroll bars). Please note that not all browsers support all of the options. The functionality of a specific option depends on both the used browser and that browser’s specific version. You also receive the dialog “Insert Hyperlink” when you right-click a standard chart and select from the context menu “Hyperlink …”. Thus, it is possible to transfer a category label or a series label by clicking a chart element, and thus to start a command that marks the corresponding values in the associated table. Hyperlinks between reports work better in combination with bundle exports/imports. By default, Hyperlinks created via the dialog “Insert Hyperlink” first try to locate the target workbook relative to the source workbook. If this lookup fails, the hyperlink will attempt to locate the target workbook based on the full, literal path, and finally it will look up by node ID, enabling a working hyperlink even if the target workbook was renamed.